Much of suburbia takes great pride in growing and cultivating the perfect lawn. It is interesting to note that lawns originated from Europe around the 1600’s. The cool, mild climate of Europe was conducive to growing grasses and various ground covers. The earliest lawns and grasses had practical applications and were used in and around medieval castles in Britain and France. The low ground cover provided guards and watchmen an unobstructed view of any approaching danger. The practical application of being able to ward off hostile enemies does not translate into current western culture. The Environmental Protection Agency (EPA) reports that landscaping and the maintenance of lawn account for approximately 30% of all water use in the United States. Considering that lawns serve no practical purpose and are purely aesthetic in nature, it seems extravagant that such a precious resource is wasted on a hangover from the 16th century. It is therefore the perfect time to reduce our lawns and start investing and/or propagating native plants, fruit and nut trees, vegetables, and other edible plants. 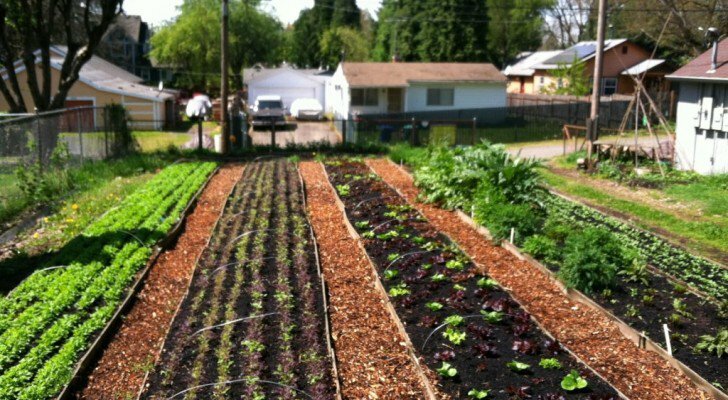 Yardfarming could help solve many of the health challenges of the West. With epidemic levels of obesity and type 2 diabetes plaguing many developed countries, backyard farming and yardfarming could significantly help to get people outside growing healthier, more nutrient dense foods. Studies have shown that people who grow their own food tend to eat healthier and share produce with others members of their family and community. Hence, the knock on effect of growing food locally helps reduce reliance on industrially produced and chemically enhanced (pesticides/GMOs) foods. A packet of seeds can cost as little as a few dollars, yet this packet of seeds can grow hundreds of plants. With the price of fruit and vegetables increasing and inflation eating away one’s spending power it makes sense to grow as much of your own food as possible. As Ron Finley says, “growing your own food is like printing your own money.” He is right, the more fresh produce one grows the less dependant one becomes on long supply chain and highly industrial food systems. It is estimated that in the U.S alone there are approximately 40 million acres of unsustainable lawns. In 2015 the fifth largest crop in the United States by acreage was the turf-grass lawn. These lawns are using valuable resources such as water, fertilizers, energy, fossil fuels, and no less importantly, our time. Each week across North America millions of gallons of gasoline are used in the weekly lawn mowing ritual. It seems a bit crazy when the U.S and Canada are doing everything possible to extract difficult highly polluting oil resources such as tar sands, deep water, and fracking that we are wasting our time and energy on making sure the lawn looks good for the neighbours. Like America, many Western countries have squandered resources around a car dependant culture, which has led to the supermarket dependant culture. It wasn’t that long ago (1940’s/50’s) that supermarkets didn’t really exist. People either grew much of their own produce or sourced meat, dairy, and other food items from their local community farmers. Today most of us will jump in the car and drive to our nearest supermarket. Being involved in growing your own food helps build community. As people grow excess produce they tend to share it with neighbours and friends, hence strengthening local networks and local community resilience. Some of the benefits of a decentralized food system include: reduced food miles, development of local food security, the adoption and fostering of improved soil quality, reduced waste packaging and storage, supporting small farms and independent grocery store owners, facilitating employment opportunities, increased flow of capital within local and regional areas, higher quality produce not dependent upon global supply chains, and better environmental outcomes in regards to pollution and use of fossil fuels. Being involved in the local food movement and yardfarming helps reduce the long distances food travels to reach us. It also makes more visible from whom and where our food is coming. Produce grown locally is often fresher than that which is purchased from the supermarket. Many supermarkets use extensive cold storage and distribution centres to hold and process fruit and vegetables. Often goods can be in transit or cold-stored for days or weeks. Without the luxury of large storage and processing facilities small local farmers and growers generally have to pick and distribute fairly rapidly to customers.